Welcome to the second annual brunch week hosted by Terri of Love and Confections and Susan of The Girl In The Little Red Kitchen! All week, we’ll be celebrating the scrumptious, lazy morning, savory & sweet goodness that is brunch. 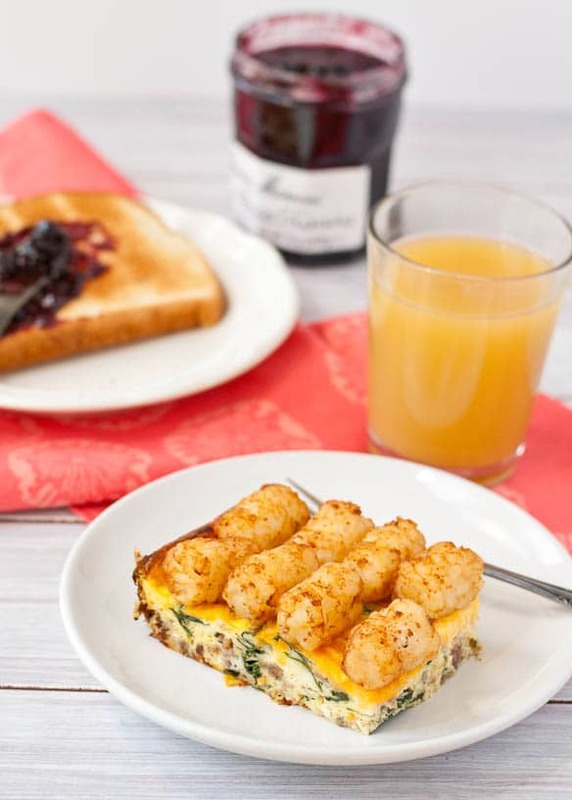 We have 32 bloggers bringing you their best brunch game, including this wonderful Cheesy Sausage, Spinach, and Tater Tot Breakfast Casserole. I’m sure it’s pretty apparent to all of you by now that we run quite a classy establishment here in the Neighborfood kitchen. I mean, nothing says elegance like tater tots. Amiright?? Wait…what’s that you say? Tater tots are the food of second grade cafeteria lunches?! Well, that’s disappointing. Because in my world, tots are for adults: two fully grown, bill paying, own-laundry-doing adults. We just so happen to love the crispy browned goodness of the humble tater tot. The glories of the tot are not lost on our adult palate. I appreciate the finely textured potato, uniform rotund shape, and slight crunch of the exterior. Even years into adulthood, the wonders of the simple, comforting tater tot casserole have yet to cease. I love tots so much, I couldn’t bear to see them relegated to mushy side dish for frozen chicken tenders any longer. These bite-sized potato cuties deserve to take center stage. And why should they only be for dinner? Breakfast seems a perfectly reasonable home for a potato bite, wouldn’t you say? And indeed it is. 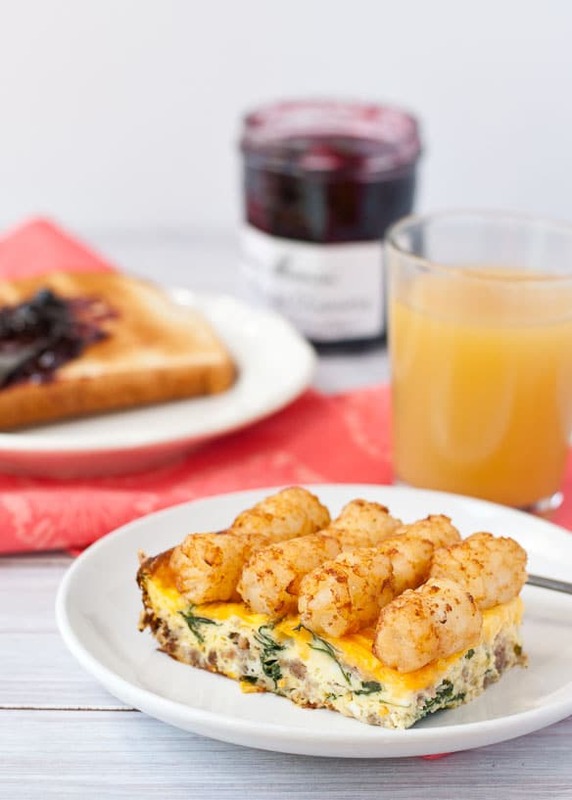 Today is the beginning of Brunch Week 2014, and I simply couldn’t resist kicking it off with this tater tot laden breakfast casserole. As breakfast casseroles go, this one is pretty standard. It’s got the basics– egg, cheese, a vegetable, and a breakfast meat–and it’s ridiculously easy to throw together. You can even whip it up the night before, refrigerate, and bake in the morning. For this version I went with sausage, spinach, and cheddar cheese, but you could really fancy it up with bell peppers, mushrooms, and gruyere. They key here is the tots. They’re lined up on top of the casserole towards the end of the bake time then baked until warmed through. 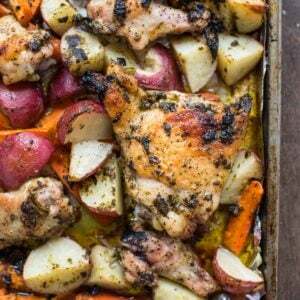 Just a few extra minutes under the broiler puts them over the edge into crispy, browned perfection. The finished product is a complete breakfast in one slice. 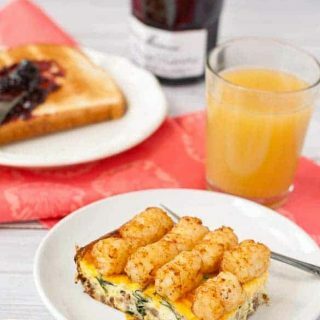 Show the tater tots some love this year, and let them have a starring role on your brunch table. 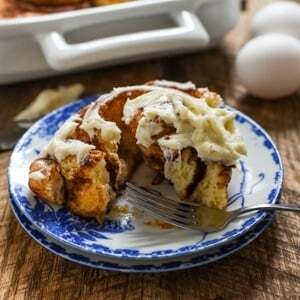 It may prompt a few giggles, but I promise no one will be laughing when they try this one dish breakfast wonder. Now, about the Brunch Week festivities. I am thrilled to be joining over 30 bloggers for a week full of all your brunch favorites. We’ve got pancakes and parfaits, egg skillets and mimosas, donuts, scones, and almost everything in between. You can follow the hashtag #BrunchWeek to catch all the late breakfast happenings throughout the week. Preheat the oven to 375 degrees. Grease a 9 x 13 inch baking dish. In a large skillet over medium heat, fry the ground sausage and onion together until no pink remains. Drain off any excess fat. Add the spinach to the skillet and stir until wilted, about 2-3 minutes. Remove from heat and pour into the baking dish. Meanwhile, whisk together the eggs, milk, and salt until well combined. Sprinkle with fresh ground black pepper. Pour the egg mixture over the sausage and stir to combine. Sprinkle with cheddar cheese. *At this point, you can cover and refrigerate overnight. Bake the mixture for 30 minutes then remove and increase the heat to 425 degrees. Line the top of the casserole dish with tater tots, return to the oven, and bake an additional 10-12 minutes, or until tater tots are heated through. I like to turn the broiler on for a few minutes at the very end to make sure the tater tots get nice and crispy. Serve warm. Disclaimer: California Walnuts, Bob’s Red Mill, Oxo, Dixie Crystals, Whole Foods Market Doctor Phillips, Grimmway Farms, Woot Froot, Vidalia Onion, Baloian Farms, Stemilt and Bonne Maman are providing the prizes free of charge. I have received product related to these brands to use for #Brunchweek. All opinions stated are my own. Carrot Cake Steel Cut Oatmeal from It’s Yummi! Raspberry Oatmeal Pancakes from Healthy.Delicious. Haha! So glad they’re a hit with other families too! I am SO a tater tot fan! Look at how perfect those tater tots look on top! So delicious looking! Thanks for sharing with #BrunchWeek. I’m completely ga-ga for tator tots and oh my GOSH, what a great way to use them! This looks phenomenal! You got to love the tator tots. I may have to hint and have hubbie make it for me on Mothers day. Um, you seriously just made tater tots look elegant. You are superwoman! You made a casserole with tater tots and for that, I will always love you. Seriously. Tots. Can’t resist. 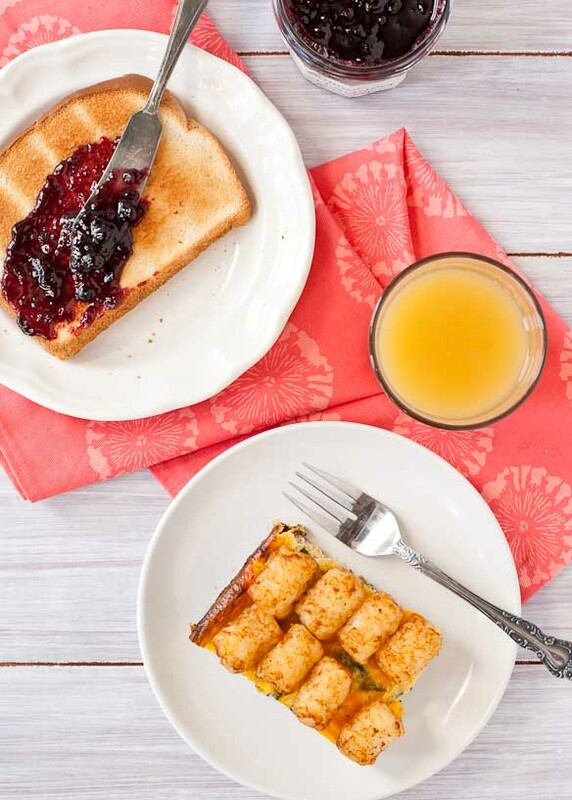 Breakfast casseroles are big around here- totally going to try this one- tater tots and all! Awesome! I can’t wait to hear how you like it! Dude, I love tater tots!!! A complete breakfast in one slice, indeed!! Love this! You and me both girl! Tots for life! I haven’t had tater tots since I was a kid! They’re definitely worth breaking out again! So good! I have not had tater tots in years but this looks really good, love that it is all in one! Only you could make tater tots look that awesome for breakfast. Nicely done! I have nothin’ but love ‘n respect for the mighty tater tot and it’s about time that they make a comeback! Girl, this looks incredible and seriously classy. I’d hoover this down in a heartbeat! That looks like a perfect breakfast to me! Are the nutrition facts shown for 1/6 or 1/8 of the recipe? I need to know before I can make this cause both of my children have Type 1 Diabetes. It is for 8 servings, but I always recommend double checking with your own nutrition calculator to be sure!